Comments The fire and intensity of the Sun is matchless. One has to just stand in the open under the hot Sun to experience its energy. 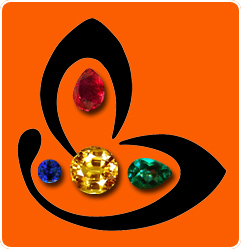 When an individual desires to implement planetary gem therapy with regard to gaining benefits from a strong or a yogkaraka Surya, what matters is that you get a jyotish quality gem. Since a natural untreated Ruby has intense energies like its planetary deity, the carat weight acquires a lesser significance in comparison to its purity or treatment free status. And then it remains to be seen, whether you can still withstand the intense power of the Sun. Featured today is a fine premium natural and treatment free Mozambique ruby of 0.83 carats. This African ruby has been set in 22-karat gold as a Sun talisman. The oval shaped gem has deep vibrant reddish pink color and has fine lustre. The clarity of the ruby is superb. Natural ruby or manik gemstone is the gem of Sun / Surya and is used to harness the energy of the king of the zodiac in planetary gem therapy. 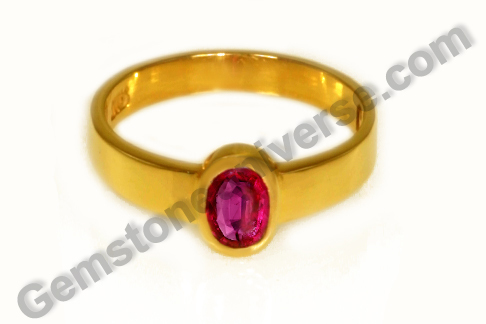 Ruby is a gemstone suitable for Leo ascendant / simha lagna individuals. Leo/Simha is a sign ruled by Sun. Exotic and richly hued, the African ruby – that from the mines of Mozambique and Tanzania, comes as a wonderful option in times when Burmese ruby has almost vanished from the markets and whatever remains is marked at prohibitive prices. Even though the price of natural ruby commands a premium, African ruby still makes it a viable option. A buyer must equip himself/ herself with good knowledge before buying colored gemstones for there is intense price variation with quality. And of course when top jyotish quality as well as mine scrap do rounds in the same markets, it pays to be aware!